You are not a true manga fan if you haven’t heard anything about One–Punch Man and that bald guy Saitama who makes hamburger out of any monster with a single blow! To tell the truth, I’m impressed by not only his incredible strength but also his cool modern look. Since the One–Punch Man manga series has become so popular, lots of fans pay attention to Saitama’s dressing style. We should mention that this young man isn’t a shy one as he happens to appear completely naked in the second chapter. Later the author, ONE, gets him up in a jumpsuit with a cape and boots so he looks like a hero. 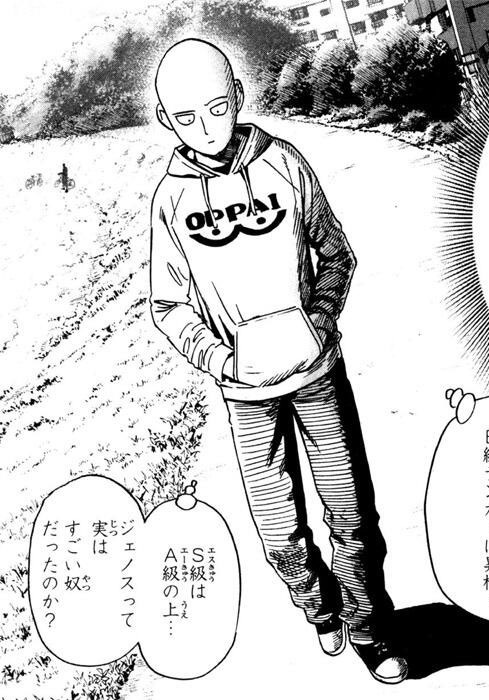 As for Saitama’s casual look, he often wears a hoodie that says “oppai”. The readers – especially young people – like this garment the most. “Oppai? What does it mean?” you can ask. 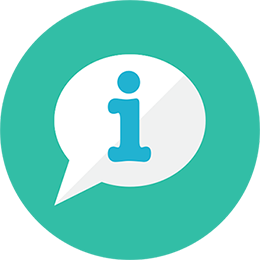 Let’s look at the drawing underneath this word – two curved lines with two spots above them. See it? Well spotted! “Oppai” (おっぱい) is a Japanese word for woman’s breasts and it’s used mainly in informal speech. We can guess that it’s the author’s original way to grab the attention of readers and make them use their imagination thinking of the meaning of “oppai”. 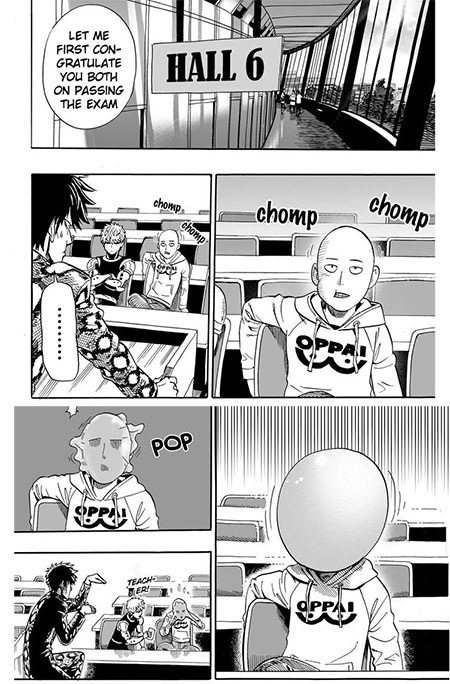 For the first time Saitama is dressed in his Oppai hoodie in the 16th chapter when he and Genos come to the Hero Association to pass the prelims. 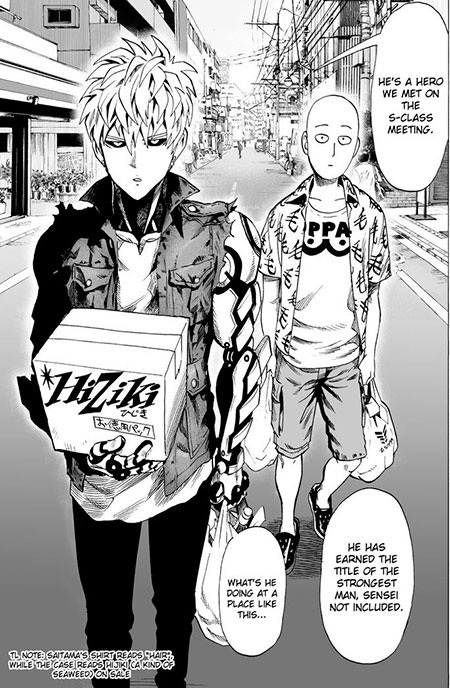 After that, we see Saitama wearing the same hoodie when together with Genos they are walking home with the groceries. Saitama feels free to wear whatever he likes and often appears with his favorite sweatshirt on. Surprisingly, most manga fans have been blown away by Saitama’s clothing choice. After One–Punch Man came out, a lot of people around the world started to wonder where they could buy exactly the same hoodie as Saitama’s. Moreover, a sweatshirt is unisex so it caught the fancy of many girls too. Also, if you have nothing to wear, there’s an easy solution – a hoodie! Referring to NSFW design, such a thing will be suitable for casual wearing and will certainly make you stand out from the crowd. Besides, this sweatshirt can be something more than a warm thing. An idea has just leaped into my mind – Oppai hoodie is good for a cosplay! Why not? Put it on and be Saitama! 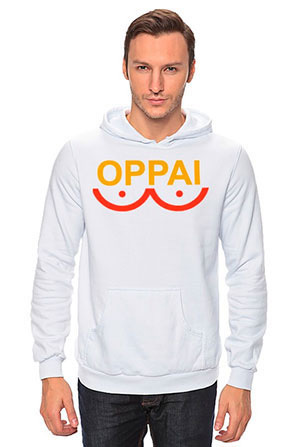 As a result, the Oppai hoodie is selling like hot cakes. That is due to not only imitation of Saitama’s style but also a bold idea of the author imaging naked woman’s breasts. I think ONE came up trumps and he still has a few tricks up his sleeve. You can learn more about ONE, his drawing, and narrative style, and also about Yusuke Murata’s version of One–Punch Man here. Oppai hoodie is a must-have for sure! 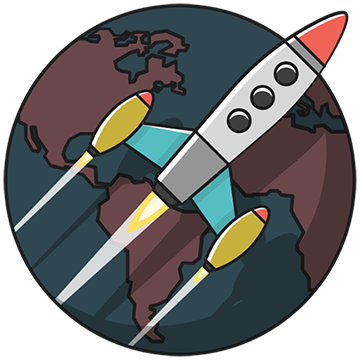 Have you bought it yet? Do you think it’s comfortable and hard-wearing? Leave you comments below. Mysterious Beings. What are they?